America's greatest nature writer and a political thinker of worldwide impact, Henry David Thoreau's remarkable essays reflect his speculative and probing cast of mind. In his poems, he gave voice to his private sentiments and spiritual aspirations in the plain style of New England speech. Now, The Library of America brings together these indispensable works in one authoritative volume.Spanning his entire career, the 27 essays gathered here vary in style from the ambling rhythm of "Natural History of Massachusetts" and "A Winter Walk"to the concentrated moral outrage of "Slavery in Massachusetts" and "A Plea for Captain John Brown." 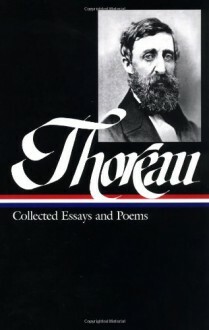 Included are "Civil Disobedience," Thoreau's great exploration of the conflict between individual conscience and state power that continues to influence political thinkers and activists; "Walking," a meditation on wildness and civilization; and "Life Without Principle,"a passionate critique of American materialism and conformity. Also here are literary essays, including pieces on Homer, Chaucer, and Carlyle; the travel essay "A Yankee in Canada"; the three speeches in defense of John Brown; and essays such as "Autumnal Tints," "Wild Fruits," and "Huckleberries" that explore natural phenomena around Concord.Seven poems are published here for the first time, and others are presented in new, previously unpublished versions based on Thoreau's manuscripts.